This page is dedicated to a critique of official documents related to Task Force Smith and the battle at Osan. That includes War Diaries, Memo's, personal narratives, and because Roy Appleman was a military historian who was tasked in 1951 by the Department of the Army to create an accurate history of the Korean War, his book "South to the Naktong-North to the Yalu" is also considered an official document where he refers to actions leading up to, during and immediately after the battle on July 5th 1950. In the course of reviewing documents relating the the battle, I have found that some official documents were prepared more to enhance the reputation of a particular individual or individuals instead of recording actual facts. Similarly, many individuals made statements to Roy Appleman which also were designed to enhance their own reputation rather than reflect actual events. In other instances, the actual facts were there but Roy Appleman did not take the time to authenticate them, nor did he even have his book accurately proofread. In one instance in his book he made a statement in one paragraph and made a contradictory statement in the same paragraph. In another instance he quoted the strength of the artillery component of Task Force Smith and three pages later, gave figures which were entirely different, both still in error based on other documents which were available to him at the time. 2. Brian Macaulay of Florida who was a 2d Lt. platoon commander of the 2d platoon of B Company of the 21st Infantry Regiment. 3. Lt. Colonel Miller O. Perry, commander of the 52d FA Battalion. (USAMHI). 5. Colonel William Wyrick who was a 2d Lt. platoon commander of a platoon of C Company, 21st Infantry Regiment at Osan. (USAMHI). 1. Sgt Ezra Burke, the Non-commissioned Officer in charge of the 30 man Medical team which accompanied the Task Force. His statement was included as part of the William Wyrick papers at the Institute at Carlisle. (USAMHI). 2. Corporal Herman V. Critchfield, a gunner assigned to Battery A, 52d FA Bn. He was the head gunner for the direct fire 105mm howitzer which stopped the first two North Korean tanks at the beginning of the battle. He was assigned to that gun because of his previous experience in the Marine Corps during WW II. 6. PFC William Thornton, Squad Leader, third squad, first platoon, B Company, 21st Regiment. (USAMHI). The battle by Task Force Smith at Osan is important because it marks the first time American ground forces engaged in combat since the end of World War II. Many authors who have wsritten about Task Force Smith have made erroneous statements about it. Roy Appleman in his book "South to the Naktong, North to the Yalu", Clay Blair in his book "The Forgotten War", Bruce Cumingds in both "The Roaring of the Cataract" and "The Korean War", T.H.Fehrenbach in "This Kind of War", Joseph Goulden in "Korea, The Untold Story of the War", David Halberstam in his "The Coldest Winter, America and the Korean War" (with over 300 factual errors, it was the inspiration for my book "The Korean War, Fiction Versus Fact), Max Hastings and his "The Korean War", Robert Leckie and his "Conflict, The History of the Korean War", General Ridgeway in "The Korean War", Bill Sloan in "The Darkest Summer", James Stokesbury in his "A Short History off the Korean War", Michael J. Varshola in his "Fire and Ice". In addition there are many errors in Spencer C. Tucker's "Encyclopedia of the Korean War because his book includes articles by many other authors. The most common error is that most authors, beginning with Roy Appleman, (Who, by the way a Captain in the Army and apparently specializing in military history and was directed by the Army to prepare an official history of the Korean War) completely ignore the fact that the bulk of Task Force Smith did not leave Itazuke Airbase in Japan until the morning of 2 July, 1950. 1. On page 61 of his book "South to the Naktong, North to the Yalu". Appleman writes that he questioned Colonel Smith about the War Diary entry stating that there were 24 C-54's available for the airlift. Colonel Smith maintained that there were only six C-54 aircraft available. Of interest here is the fact that only six C-54's made it to Pusan on July 1, while at least ten more made it the next day. The first memo below with date/time of 1 July at 11:35 AM indicates that two planes are in the air and 13 more are loaded and ready to leave at 20 minute intervals. First plane was off at 11:05. The memo shown below indicates that there were 24 aircraft available, why else would Lt. Colonel Smith refer to 24 airlifts? 2. Also on page 61 he states that only 406 men were air landed in Korea on 1 July. Sergeant Clifford Johnson of Hq & Hq Company, 1st Battalion, 21st Infantry Regiment, who was on the same plane as Lt. Colonel Smith wrote in his narrative that only about 120 men arrived on 1 July. All of those men immediately boarded a train and went to Taejon, arriving there early in the morning of 2 July. After a brief consultation with Brigadier General Church, Lt. Colonel Smith and the few officers who had arrived drove the 80 miles north to pick out defensive positions just north of the village of Osan. 3. On page 62 Appleman ignores the fact that most of Task Force Smith arrived on 2 July. Narratives by Cpl Norman Fossness, Sgt Ezra Burke and Colonel Willilam Wyrick, then a 2d Lt. Platoon Leader in C Company, indicate that they spent the night of 1 July in an empty hangar at Itazuke Airbase. The 8th Army War Diary for 2 July states that by 8:15, two planes had already arrived at Pusan and that at least eight more were in the air on the way. 4. In the first full paragraph on page 63 he writes that Smith's divided command was reunited on 4 July at Pyongtaek. The War Diary for 3 July for the 21st Infantry Regiment, shown below indicates that Lt. Colonel Smith's command was split into two groups on that day by General Church. The two pages of the War Diary for 4 July are shown immediately below the one for 3 July. 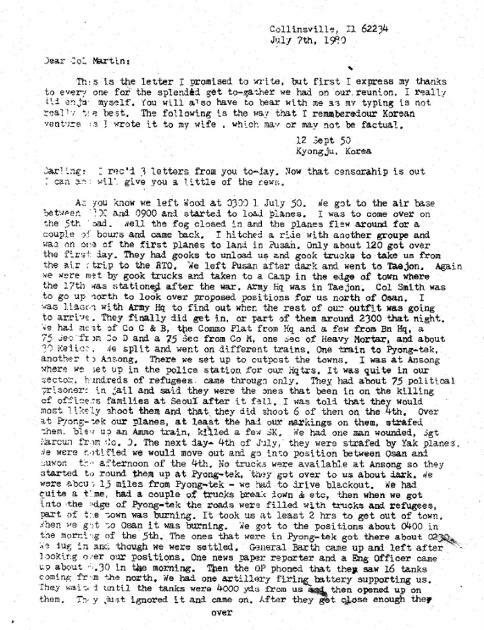 Narrative by Sgt Clifford Johnson (first page below) indicates that because of a lack of vehicles, the group from Ansong did not reach the positions north of Osan until about an hour and a half after the group from Pyongtaek arrived. 5. On page 63 Appleman writes that the contingent from the 52d Field Artillery commanded by Lt. Colonel Perry numbered 108 men. Several pages later on page 68, he states that there were nine officers and 125 enlisted men in the artillery contingent. Obviously his book was not properly proofread for errors before publication. War Diary and narratives show that there were 180 men and 73 vehicles and that it took 38 flatcars to transport all the equipment. Lt. 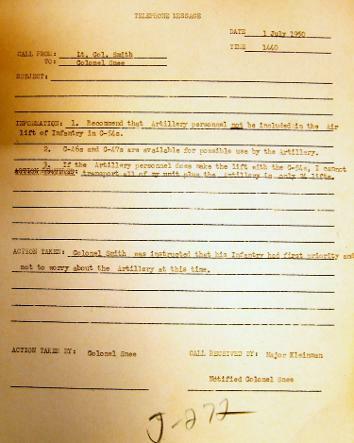 Colonel Miller's narrative indicates that he tried to comply with the Directive from the 8th Army that directed that all units initially going to Korea be brought up to full Table of Organization and Equipment (TO&E) strength. He wrote that he transferred all available men and equipment from other 24th Division artillery units. Records show that there were ten officers regularly assigned to the 52 FA Bn who were a part of the artillerysupport for Task Force Smith. In addition a South Korean Artillery Officer, Captain Seung Kook Yoon, joined the artillery before it left Taejon. In addition a KMAG artillery officer, 1st Lt. Everett G. Andrews was with the artillery unit at Osan. 6. At the top of page 66 Appleman writes that Colonel Smith placed one platoon of B Company on the high knob immediately west of the road. Alan Macaulay, who was a 2d Lt. commander of the 2d platoon of B Company stated in a phone interview that he placed only a squad, reinforced by a light machine gun on that knob and that after the tanks had passed by and just as the North Korean infantry were approaching, he ordered that reinforced squad to return across the road to rejoin the rest of the platoon. The gunner, PFC Gonsalez refused to return as the enemy was so close that the squad needed his covering fire so that they could safely cross the road. They made it safely, but Gonsalez was captured, his assistant was killed and Gonsolez spent 38 months as a prisoner of war. Lt Macaulay recommended him for the Congressional Medal of Honor, but higher authority reduced the award to The Distinguished Service Cross, the second highest award just below the Congressional Medal of Honor. 7. In the last paragraph on page 66 and which continues on to the top of page 67, Appleman writes that two jeeps in tandem pulled the guns into place. See first paragraph of the third page below which states that the ground was so muddy that they had to winch a 6X6 truck onto the site and then winch the guns into place. 8. In the first full paragraph on page 68, Appleman writes that volunteers from the artillery Headquarters and Service Batteries made up four .50 caliber machine gun and four 2.36 inch bazooka crews crews.